Designer Ladies Suit offered comes in exclusive choices that are designed and developed keeping in mind the emerging demands of the market. These suits are available in flawless work presented on fabric’s surface as well as use soft and quality fabric choices which makes these highly desired dressing choices of the customers. Some of its features include available in contemporary designs, available in different size choices, exciting color tones, meet demands of distinguished looks of style conscious customers, designer finish that provides for perfect Indian look. Embroidered Suit offered comes in exclusive choices that are designed and developed keeping in mind the emerging demands of the market. These suits are available in flawless work presented on fabric’s surface as well as use soft and quality fabric choices which makes these highly desired dressing choices of the customers. Some of its features include available in contemporary designs; available in different size choices; exciting color tones; meet demands of distinguished looks of style conscious customers; designer finish that provides for perfect indian look. 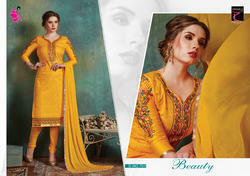 Ladies Salwar Suit offered are designed to provide for simply stunning dressed looks. Meeting demands of adding a touch of style and grace to the dressed appearance of ladies, this party wear collection supports adding glamour to personality of wearers. Some of its features include beautiful ornamental appearance; best wear choice for parties; available in soft & bright color choices; meeting demands of elegant wear for special evenings; fine work quality presented on the fabric that assists in enhancing overall finish appeal provided to these apparels. Fancy Embroidered Salwar Kameez offered come in glorious designer patterns and can be made available in different color prints. Having in them a touch of class and exclusiveness, these ladies suits create for unique styles as well as highly presentable dressed looks. Some of its features include vibrant finish which make these highly desired by ladies; provides for stunning presentation looks; adds a touch of grace to personality of wearers; smooth designed finish; available in different sizes from small, medium to large. We are manufacturer and supplier of Designer Churidar Suit available in unique design and vibrant colours. Fashion Salwar Kameez offered comprise beautiful printed fashion wear choices that support the demands of enhancing dressed looks of look conscious ladies. Further, this designer collection also adds a distinguished look to the wardrobe collection with tis interesting fusion of colors making the dresses all the more wanted by the customers. Some of its features include perfect finsh that catches attention of gathering; eye-catching print choices; helps wearers in making their own style statement; comfortable to wear choice; eye-catching work finish which makes these worth flaunting. Fancy Embroidered Salwar Suit offered come decked with beautiful work done on the fabric as well as interesting patterns which helps in providing enhanced overall finish appeal to these apparels. As highly preferred choice for different social occasions, these enchanting designed salwar suit collections also assist in enhancing the dressed looks of the wearers. Some of its features include attractive and elegant finished presentation, choice of color variations as per the specific tastes of customers, makes wearers look at their stylish best, provides for trendy fresh looks.